Super Sequel NOT YOUR VILLAIN–Review and Giveaway! Hi there! 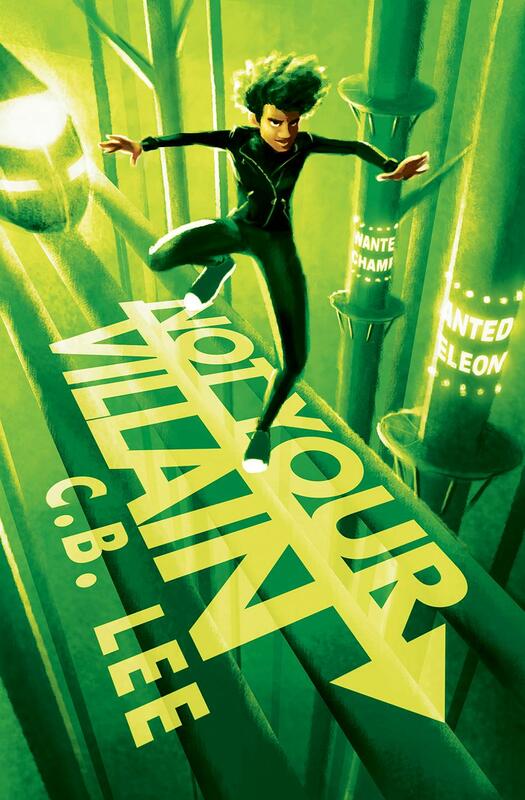 Today I’m sharing a review for a new YA LGBTQ-friendly superhero novel from CB Lee. NOT YOUR VILLAIN is the second book in her Sidekick Squad series and is a fantastic follow-up to NOT YOUR SIDEKICK. Both books are set in the US, a little over a century into the future, when superheros and villains take center-stage in the world…and Bells is a master of his future. Check out the excerpt and be sure to enter the $25 GC and book giveaway below! Bells has only seen Orion in holovids and during that one, frenzied encounter at Abby’s house. It’s startling how different she looks now from the shiny, polished hero who graced comic book covers. Her hair is tied in a messy ponytail; her bangs fall limp across her forehead. She’s wearing her usual blue-and-white supersuit, but Bells has never seen it this dirty or in such a state of disrepair; there’s a patch ripped in the leggings, and her knee is poking out. Orion’s cape trails behind her; the edge is frayed and riddled with dirt. The cart she dragged in rolls onto it, causing her to stumble. Orion yanks her cape free of the cart, straightens up, and glares at Bells, as if she’s daring him to laugh. Bells recognizes the machinery sitting on the cart; it’s one they used at the training center to measure the power levels of meta-humans. He remembers the last time he was tested. All the other students had taken care not to use their powers all day so they could get an “at rest” rating and be sure that the League could see their full potential. He kept his Barry shift on all day, so that by the time he was measured, he’d be so tired out he’d get a low rating. What does Orion want with me? Orion flips through the thick sheaf of papers. Bells takes a deep breath when he spots the word Broussard, followed by a photo of the restaurant and even a picture of him and Simon as kids. The file must have been important for Orion to print them on actual paper. Or maybe Orion can’t connect to the Net anymore. How long has she been on the lam? What was she proposing to Stone? The League obviously doesn’t know where she is, since they still claimed she was in Corrections. Even if she doesn’t have the League behind her, she’s still dangerous, especially if she knows who he really is. Bells has grown up in Andover, a smallish town in the Nevada desert, several hundred miles from what remained of Los Angeles, after the Disasters and World War III are just stories in history books. Nearly 100 years ago, when humanity was still fighting to survive, there was a series of large solar flares that caused cataclysmic events, and generated the first generation of meta-humans, humans with super powers, of any type. Bells is a black transboy with the power to alter his appearance, and that of anyone or anything he touches. He’s dealing with the meta-human stuff pretty well for a kid whose parents run a black market agribusiness. Oh, and who also has a long-time crush on his best friend Emma. In the beginning he keeps his identity as “Chameleon” one of the newly inducted member of the Heroes League of Heroes. Unfortunately, Jess, who has an undetected super power recognizes that Bells has been made a pawn in the game of heroes vs. villains. Jess noticed that the “villains” that Chameleon was impersonating on a series of “training missions” all had characteristics of her good pal, Bells, and Jess reveals the bigger plot that surrounds a group of missing villains, and Captain Orion, leader of the Heroes League. This story overlaps NOT YOUR SIDEKICK and picks up with Jess, Bells, and their other pals trying to rescue Jess’ girlfriend Abby’s parents from captivity. Abby has a super power, but she’s been given a serum by Captain Orion to negate her mechanopath abilities. Just as Bells is getting a handle on his powers and his feelings for Emma, life gets in the way. Ema finds her own boyfriend, and Chameleon’s activity in rescuing Abby’s mom leads to him being listed as Public Enemy ! by the Heroes League. That said, he finds some comfort in pals that didn’t have strong enough powers to make it into the League–and his mission to unmask the REAL villains of this world (think grown-ups in the government) brings some results. To a degree. If nothing else, Jess’ superhero parents take their mission seriously, and superheroes and villains are uniting to defeat the actual bad guys and bring justice to those who need it. I love the multicultural cast, and the world is beautifully rendered. All to locales jump off the page, and Bells’ plight, in life, love and activity, is a sympathetic one. I love his sweetness, and his commitment to do the right thing even when it’s really, really difficult. It seems as if Bells’ perserverance wins him both the respect and validation he sought when he hungered to be a hero, and I was happy for that. I wonder who will lead us to eventual victory in book three. It feels like Jess’ sister Claudia is a strong candidate. This is an excellent book series for teens who are identified, or questioning, in the LGBT spectrum, as the relationships are all affirming and fluid. Bells is trans, Jess is bi, but seriously dating a girl, Emma has two moms, and there are many other examples of queer life, too. This world posits that nothing is unusual about those connections, and that felt pretty super, too. Interested? You can find NOT YOUR VILLAIN on Goodreads, Interlude Press, Amazon, Barnes & Noble, iTunes, Kobo, Smashwords, Book Depository, and Indiebound. Rafflecopter giveaway link for your chance to win a $25 GC to Interlude Press, or one of FIVE e-books of NOT YOUR VILLAIN. You can find C B online on her website, Goodreads, Facebook, twitter and Instagram. Thank you for having me your blog and the lovely review! My pleasure! I’ve really enjoyed the series so far.